Community organizations are once again teaming up to bring the free, annual Ocie Hill Community Block Party to the Mansfield Community. At the 3rd Annual Community Block Party everything is FREE! 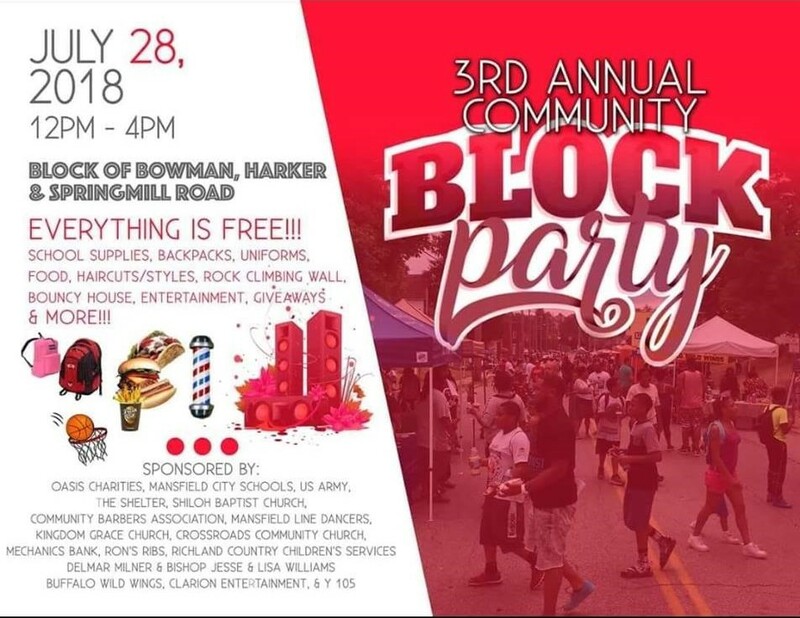 The block party will be located near Ocie Hill Neighborhood Center at the block of Bowman, Harker, and Springmill Streets. This event has been generously sponsored by Oasis Charities, Mansfield City Schools, US Army, The Shelter, Shiloh Baptist Church, Community Barbers Association, Mansfield Line Dancers, Kingdom Grace Church, Crossroads Community Church, Mechanics Bank, Ron's Ribs, Richland County Children's Services, Delmar Milner and Bishop Jesse and Lisa Williams, Buffalo Wild Wings, Clarion Entertainment, and Y-105, to bring the community a day of FREE fun!